Sun. Shade. Wet. Dry. Tall. Short. Spreading. Contained. Don’t be intimidated by your steep slope. Start with your objective, identify any gardening problems you need to solve, and then select your plants. With thousands of plants to choose from, you’re bound to find the right ones for your space. Diverse planting of conifers on slope. 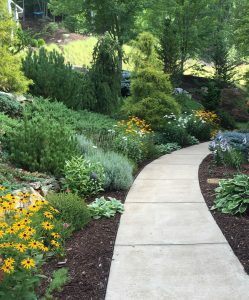 Low maintenance, erosion control, and all-season interest—especially during winter months—are typical gardening goals on slopes. Our acidic soils and a sunny hillside make an ideal environment for conifers. Nurseries will present you with an almost unlimited variety of conifer shapes, sizes, and colors from which to choose—spruce, cypress (Chamaecyparis spp. ), pine, hemlock, arborvitae, and juniper. Conifers require little—if any—pruning, and typically are disease and insect free, making them well-suited for low-maintenance hillsides. Just know the natural growth habit of the variety you select. Is the conifer you choose a tree, shrub, or groundcover? A Norway spruce (Picea abies) can grow into a 90-foot tall tree, while a dwarf globosa blue spruce (Picea pungens ‘Globosa’) will remain a compact shrub, only three to four feet tall. While the variety of junipers can be mind-boggling, there’s nothing better to cover and hold a dry, hot slope than a spreading juniper (Juniperus horizontalis). Just be sure you have enough space because some junipers like ‘Shore’ and ‘Blue rug’ will spread ten feet or more. Nellie R. Stevens hollies hide retaining wall. 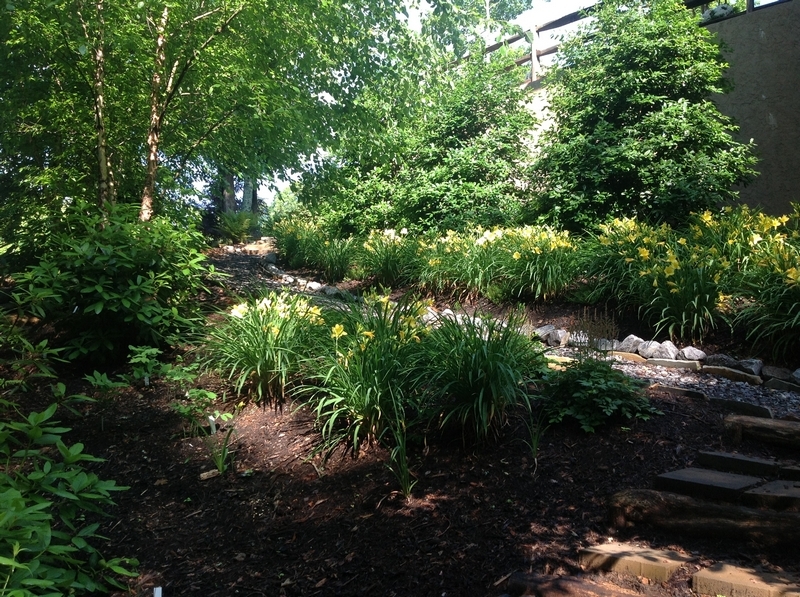 Daylilies outline path and camouflage lower holly branches. Hollies (Ilex spp. ), like conifers, suit our WNC environment. They come in a vast variety of shapes, sizes, and colors. Some are evergreen; other are deciduous. ‘Nellie R. Stevens’ hollies are workhorses and provide outstanding privacy screens. There’s nothing prettier in the winter than the native winterberry holly (I. verticillata) covered with red berries—‘Red Sprite’ is a great cultivar. If you’re looking for an evergreen holly that thrives in moist soils and sends up shoots from root runners to hold soil on steep slopes, try the native inkberry holly (I. glabra). Japanese hollies (I. crenata) are often the perfect size for foundation plantings, but are highly susceptible to diseases, including root rot in poorly drained soil. Shrubs that like wet soil and work especially well near the bottom of a steep slope or in an area that takes lots of stormwater runoff include sweetspire (Itea virginica), summersweet (Clethra alnifolia), and red twig dogwood (Cornus sericea). Plant these, give them lots of room to grow, and ignore. Ornamental grasses are excellent choices for dry, sunny slopes and they mix well with other shrubs and perennials either in masses or as individual specimens. Your ornamental grasses will need maintenance in the late winter—namely climbing your slope to cut them back to near-ground level just before new growth emerges. 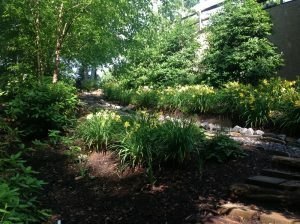 For shady spots, think ferns and hostas. Shrubs such as hydrangeas, viburnums, and fothergilla add colorful interest to your slopes. Again, know the growth habit of shrubs you choose. Some viburnums can reach 12-feet tall, hydrangeas may need staking on a steep slope when their spreading branches are heavy with blossoms, and Fothergilla major tops out at 10 feet, but dwarf Fothergilla gardenii is a modest 3-feet tall at maturity. Speaking of staking—do you want to grow perennials or annuals on your slope? If so, be sure they have sturdy stems or plan on staking them. Tall flowers flop, especially after a heavy rain. 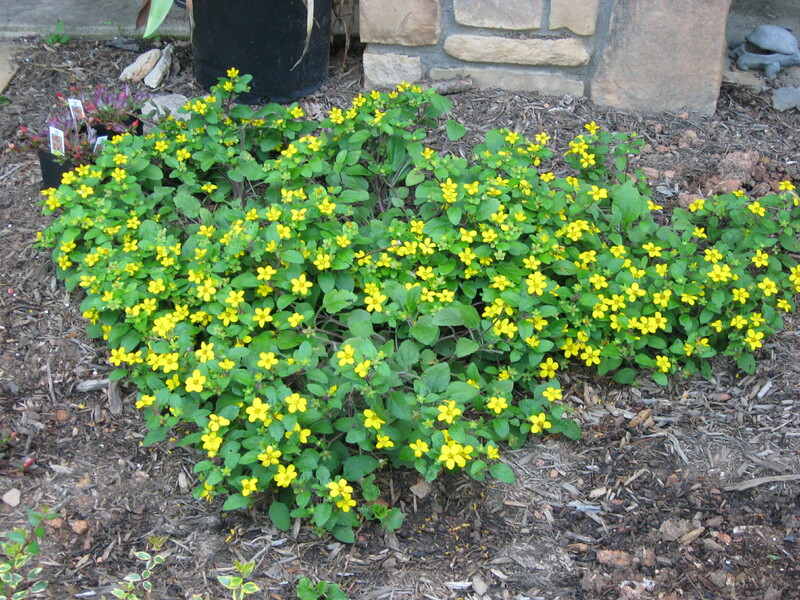 We often want low-growing groundcovers to hold the soil on our slopes and carpet the ground beneath shrubs and trees. I’ve already mentioned creeping juniper for sunny, dry slopes. If your hillside is part sun to shade, try pachysandra—either the native Allegany spurge (P. procumbens) or the Japanese variety (P. terminalis). At less than six-inches tall, spreading, and evergreen, pachysandra makes a pretty groundcover summer and winter. Or you might cover your slope with low-maintenance creeping red fescue—a fine-bladed grass that stays green in winter. 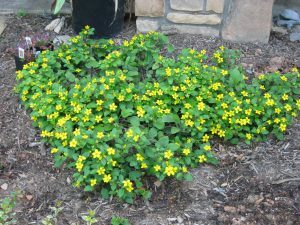 Other low-growing choices are green-and-gold (Chrysogonum virginianum) and creeping St. John’s wort (Hypericum calycinum), although both brown out during the winter. Perennials such as dwarf crested iris, catmint, stachys, and ajuga all make good groundcovers on slopes. Warning! Never plant invasive species such as English ivy or periwinkles (Vinca major and V. minor) as a groundcover. And beware other aggressive groundcovers such creeping raspberry (Rubus pentalobus). While only English ivy climbs and helps kill trees, you’ll need to dedicate many gardening hours to pulling trailing vines to keep any of these plants in bounds. Analyze your site, have a plan, install your hardscape and access paths, and spend time thoroughly researching your plant options. You will then be ready to select the right plant for the right space on your garden slope.